For years, there has been software apps for desktop computers that could be used to create prints that look somewhat like your paper scrapbooks. Much like writing on a piece of paper and typing out a letter on a computer, the experience is different when there is paper in hand versus a computer mouse. 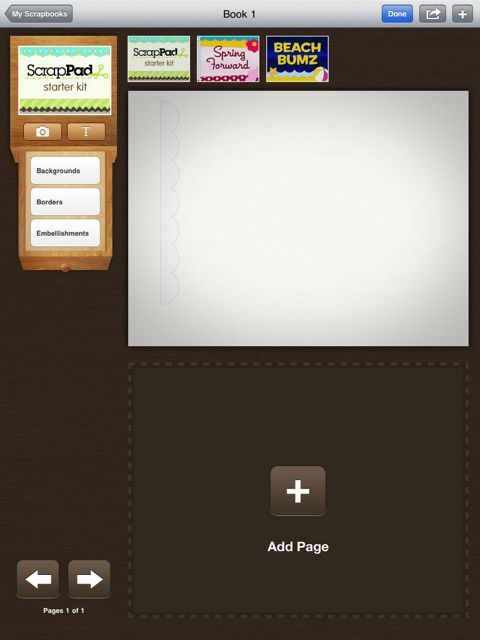 Most Scrapbooking computer programs are super simple page layout apps that have gotten slow buy in from the true Scrapbooking person. 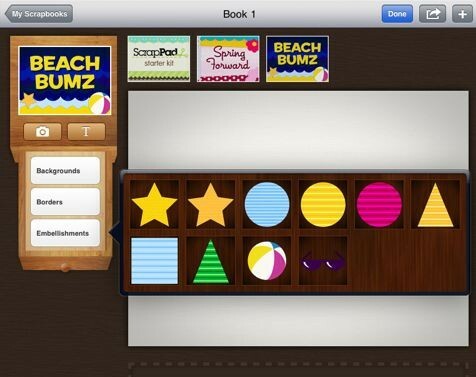 ScrapPad for the iPad may just be able to break down the wall a bit. The taping and moving of images with a person’s finger adds a human touch to creating exciting pages. Add a image, add a frame, twist a bit of embellishment, choose a background paper, type in text and even send out to your friends. All things that work so much better with your fingers involved than a mouse. 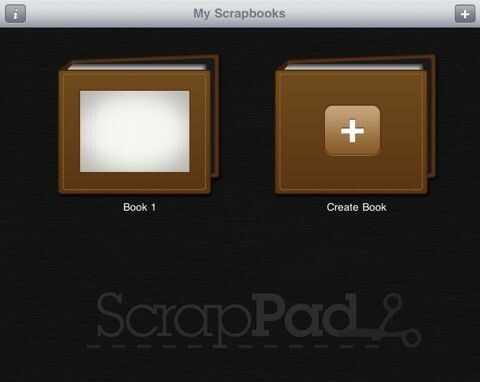 Within the ScrapPad app, you choose to create a new ‘Scrapbook’. 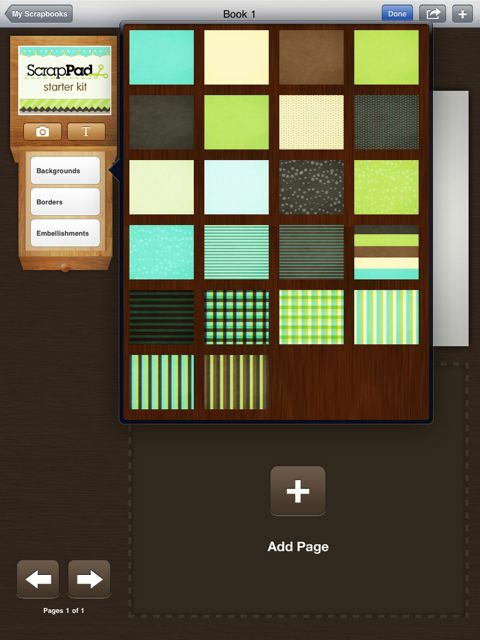 Across the top of the ScrapPad page is several theme ‘kits’ of backgrounds, Borders and Embellishments. The developer promises many more to come. You can use any art bits of any of the kits on a single page. Having the art divided this way into Kits just makes for a more manageable viewing when trying to choose art rather than an endless scrolling page. Choose any kit to have it appear from the file cabinet drawer on the left. This is an example of the backgrounds or ‘papers’ in the first ‘kit’. Choose any one or non to use. You can have multiple embellishments on any page to get the effect your looking for. Here is the ones in a different kit than we showed the backgrounds from above. Don’t worry if the angle isn’t right, you can turn and resize via two finger pinching and twisting. Pictures can be added from Photos area (note the camera icon on the left, top of the cabinet). Like embellishments, pictures can be twisted and resized anytime your in the edit mode of your Scrapbook page. A pleasant surprise was holding your finger on anything on your page will bring up the option to move that item to a different layer, forward or back… as well as delete. 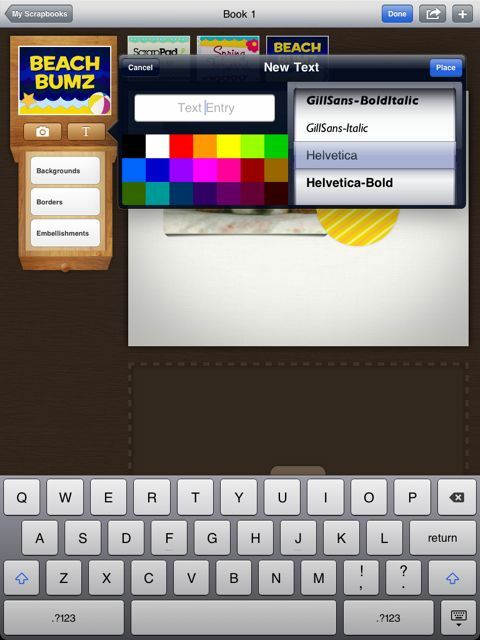 Text can be added in a variety of colors and fonts. 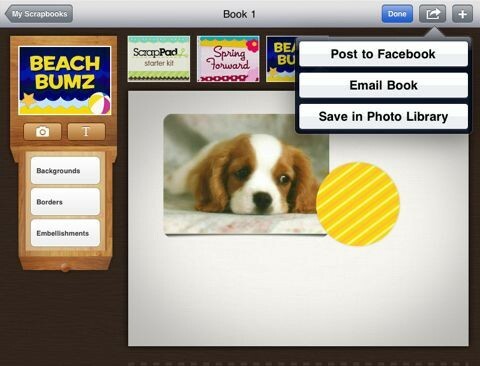 Finally, when your done (yes, this isn’t a scrapbook page we would be proud to show mom, it’s just an example of the features we were playing with) you can share out the page or full book to Facebook, via email or save to the built in Photo area. If your not able to keep a close eye on your kids when they have the sudden desire to create a scrapbook this is a great option to a pair of scissors in little hands. We love paper, but it’s nice to see we have an option that actually feels right when you use it. 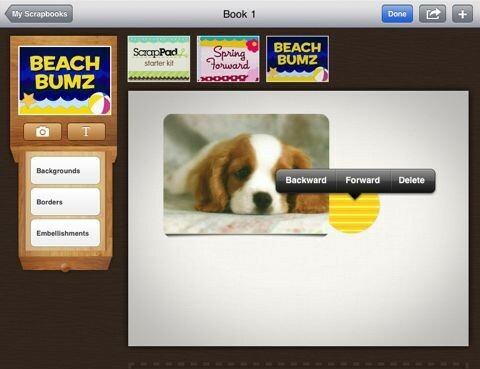 ScrapPad is a great bit of fun to use around the house for creative time or while your watching TV.